No, it's not another song, it's a simulation. I found out about HyperKat Games through somebody's blog (probably Hobbyspace.com though I can't find the post now). They have some military games but also a couple of space related simulations in work, including a Mars Colony Simulator (in development but there's a blog) and a Planetary Rover Simulator for which there is a free demo. I downloaded the rover demo, and it's pretty cool. 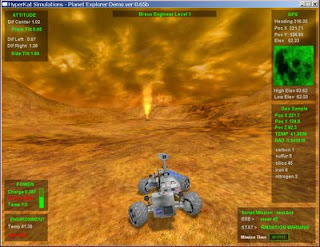 You control a robotic rover similar to the real Mars Rovers, including the fact that you can't personally drive the rover in real time, you have to write a script to control it and complete a designated mission. There are just five missions in the demo which is otherwise fully functional. The scripting language is pretty similar to Logo or Etoys (though it is purely text based, with commands like forward 10, steer -30, and groundsample), and there are hazards to avoid, such as thermal vents, extreme slopes, and high-radiation levels. You view the execution of your script "in real time" (though since you can't intervene, it could just as well be a playback of a video sent back from the planet after the fact). The 3D terrain and sky graphics are pretty nice. I imagine that the full package will have alternate planets with many more missions and different challenges. This demo is a nice addition to my space simulation bag of tricks. The "buy now" link on the main page is inactive so maybe the full package isn't available yet.